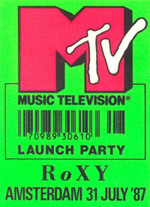 Caroline joined MTV Europe's press department in 1987, prior to the channel's European launch, as a tri-lingual press officer. As part of the launch team, she worked on an ambitious launch event, which included hiring two private jets and flying a coterie of pop stars - including Elton John, Boy George, Donny Osmond, Iron Maiden and The Stranglers - from London to Amsterdam and back in one night. Caroline helped MTV win its Belgian franchise by acting as a simultaneous translator for MTV's CEO at an open forum meeting with the Belgian media. Caroline then joined the production team at MTV and went on to write all of MTV Europe's hourly news bulletins, editing stringer items from across Europe. Caroline was a journalist / presenter on Janet Street-Porter's seminal, live Sunday afternoon youth series 'Network 7' on Channel 4. Caroline co-presented the first ever series of 80s children's TV hit 'Motormouth' on Saturday and Sunday mornings on ITV. 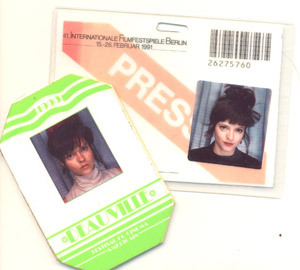 For BSB's daily Film Show, Caroline produced, directed and edited film stories from the UK and from film festivals including Cannes, Berlin and Deauville in 1989/90. Amongst the many stars and directors Caroline interviewed were: Lauren Bacall, Anthony Hopkins, Donald Sutherland, John Hurt, Martin Sheen, Timothy Dalton, Roberto Benigni, Lou Diamond Phillips, Larry Fishburne, Ken Loach, Hugh Hudson, Martin Scorcese, Isabella Rossellini, Jim Jarmusch, Sidney Lumet and Louis Malle. Caroline was the Celebrity Recruitment Manager for Trading Places in 1991/92, a fundraising event set up by Breakthrough Breast Cancer, which concluded with a live ITV show fronted by Cilla Black, followed by a live Channel 4 show fronted by Hale and Pace. Amongst the celebrities Caroline recruited were Cher, Gazza, Dame Edna Everage (Barry Humphries), Bob Hoskins, Rab C Nesbitt (Gregor Fisher), Joanna Lumley, Anneka Rice and MC Hammer. The event became so high-profile, with coverage in every national UK newspaper, that even the then Prime Minister John Major turned the cameras on the press in reference to the event. 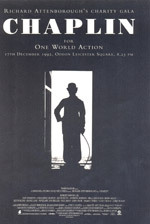 Whilst helping Julia Hobsbawm set up her own PR company (which became Hobsbawm Macauley with Sarah Macauley, later Mrs Gordon Brown), Caroline handled a number of special events, including selling out The Odeon, Leicester Square for Glenys Kinnock's One World Action charity premiÃ¨re of the film 'Chaplin' and a highly successful fundraising event for The Face magazine (following the infamous lawsuit by Jason Donovan, which threatened to close the magazine down). 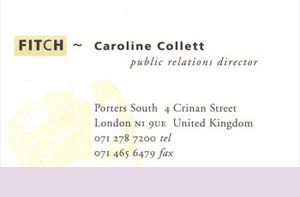 Caroline's first exposure to design PR was in 1993, when she was appointed as Global Public Relations Director of Fitch offices worldwide, under the direction of the company's legendary founder and Chairman, Rodney Fitch. As a baptism into the world of design, the role couldn't have been better, encompassing everything from shopping centre and department store retail, to leisure, exhibition, product, signage, graphic and interactive design. 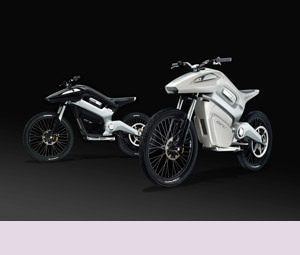 IN 2005, Caroline was commissioned by both Seymourpowell and its client Intelligent Energy to oversee the launch of ENV, the world's first purpose-built hydrogen motorcycle. Caroline directed the UK launch of ENV at the London Design Museum and appointed a US PR agency, whom she then directed for the successful US media launch of the bike in Los Angeles. The resultant media campaign led to coverage all over the world, with a global audience reach of over 342 million people, including 501 television appearances, 669 radio appearances and 503 print articles. These included Time Magazine in the USA and the front page of The Guardian in the UK.